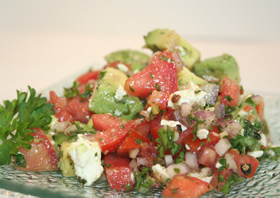 A refreshing salsa for warm summer evening. Serve with tortilla chips or serve with grilled or baked fish. Add mangos or grilled corn or grapes or even strawberries to make a fruity salsa. Gently stir in the oil & vinegar. Then add feta.